One of the benefits of living in the Triad region of North Carolina is the great weather we experience practically year-round. Where some areas of the country might limit grilling and outdoor activities to the summer months, we can enjoy our grills and outdoor spaces from early spring into late fall. And with the right shelter, fire pits or outdoor heaters it can even be a year-round experience. 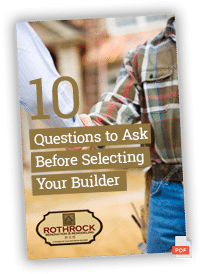 Rothrock Renovation & Remodeling has had the opportunity to help many homeowners around our area create beautiful outdoor livings spaces to enjoy with family and friends. If you’re thinking about creating an outdoor kitchen to expand your entertaining options, here are a few things to keep in mind to help with your design and planning. Outdoor kitchens can be as big or as small as you want. A space as small as 256 square feet, at 16X16, works well for a grill and seating for a family to have a place to unwind after a busy day. For entertaining larger crowds or for people looking to do a lot of cooking outdoors, an area 500 square feet or more provides plenty of room for a nice kitchen, a seating area, and perhaps a fire pit or other accessories. Keep in mind when planning your outdoor kitchen that the materials you choose will need to withstand the elements. Site-built masonry products, whether brick or stone, provide a good, solid base that will last for years and are preferred over the pre-fabricated kits. Stainless steel appliances work well outside because they’re easy to clean and corrosion resistant. Many people also choose stainless steel cabinets or storage options, but you can also go with wood, as long as it’s a species that will work well outside. Options such as teak and cypress can weather the elements well. And of course, the countertops help set the tone for an outdoor kitchen just as much as they do inside. Stone counters make a great statement piece and are perfect for the outdoors. You can also choose granite, but keep in mind large pieces with minimal seams or joints are preferred. One of the wonderful things about creating an outdoor living space is that you’re not limited by walls and windows, the sky’s the limit on where you can place things. But it’s still important to work within some of the basic rules of design to end up with a finished product that you enjoy and can use efficiently. With kitchen design, it’s good to keep in mind the triangle philosophy, which means placing the functional zones — cooking, prep area and storage — within a working triangle that’s in relatively close proximity. Rather than walls, think of your equipment as the boundaries for the area. And remember to think of the kitchen itself as just one more outdoor room, allowing for good flow with the other rooms such as the pool area and the yard or garden. We’ve designed outdoor kitchens with as little as a few cabinets and a prep area to fully stocked spaces with sinks and refrigerators, but in all of them the grill takes center stage. There are so many options in today’s market that you can do almost anything you want with your cooking area, whether it’s a built-in gas grill, electric grills, or an outdoor fire pit for smoking meats. You might even choose to have more than one grill, to provide different options for cooking or to give you more grill space for entertaining large crowds. When designing your outdoor kitchen, be sure to keep the end in mind. Things like built-in planters and well-designed lighting help create the perfect atmosphere for relaxing or entertaining. Many landscaping projects are easy enough to tackle on your own, but when designing and building an outdoor kitchen it’s beneficial to enlist the help of a contractor for a number of reasons. We can help plan the site and grade it to reduce the risk of flooding or other weather damage. We also can help plan for and install any utilities needed, including electricity, water or gas lines. And with our experience in building outdoor living areas, we can provide advice on the best materials and appliances to bring lasting beauty to your project. 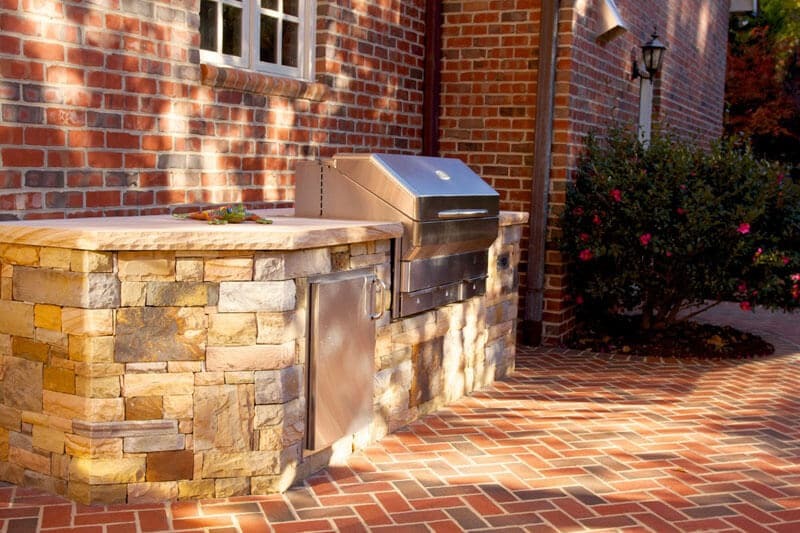 If you’re thinking of adding an outdoor kitchen to your home, our experts at Rothrock Renovation & Remodeling can help you create the space you’ve always dreamed of. Call today for a consultation.